A look at this week’s art news, including a new artist collective formed in opposition to Trump’s most recent travel ban, and events and exhibitions from Detroit to Düsseldorf. A look at this week’s art news, including the third Nasher Sculpture Prize to be won by an Art21 artist, and events and exhibitions from Las Vegas to London. In September, Art21 released the a new “Extended Play” film documenting Julie Mehretu’s monumental commission for the new SFMOMA. A look at this week’s art news, including Mel Chin’s new public artwork in Philadelphia, and events and exhibitions from Boston to Berlin. The Art21 staff presents a selection of our favorite fall exhibitions on view in New York. A look at this week’s art news, including a special Time Magazine project honoring women, and events and exhibitions from Paris to Philadelphia. A look at this week’s art news, including a new public art commission for Times Square, and events and exhibitions from Los Angeles to London. A look at this week’s art news, including Ai Weiwei and Trevor Paglen’s new Kickstarter projects, and events and exhibitions from Venice to Mumbai. In August, Art21 released the final two “Summer of Shorts” films, published new magazine articles and a new playlist. A look at this week’s art news, including Kara Walker’s artist statement about not wanting to write an artist statement, and events and exhibitions from San Jose to London. A look at this week’s art news, including a public reconciliation between Marina Abramović and her former partner Ulay, and events and exhibitions from Chicago to Salzburg. A look at this week’s art news, including Cindy Sherman’s recent splash on Instagram, and events and exhibitions from Oklahoma to Buenos Aires. A look at this week’s art news, including Laurie Anderson’s debut album receiving new praise, and events and exhibitions from Detroit to Denver. See what Art21 was up to in July, including four new “Summer of Shorts” films, a new interview, and a new issue of the Art21 Magazine. A look at this week’s art news, including the Brooklyn Museum’s powerful new exhibition, and events from Los Angeles to London. A look at this week’s art news, including a progressive move by the North Carolina Museum of Art, and events and exhibitions from Louisville to Hong Kong. A look at this week’s art news, including Ai Weiwei’s new magazine cover, and events and exhibitions from San Francisco to Copenhagen. A look at this week’s art news, including the latest commission of Nick Cave’s collaborative community performance “Here Hear,” and events and exhibitions from Santa Fe to Seoul. See what Art21 was up to in June, including four new “Summer of Shorts” films and the selection of ten new Art21 Educators for the program’s seventh year. A look at this week’s art news, including Richard Serra’s newly released poster for the 55th New York Film Festival, and events and exhibitions from Milwaukee to Los Angeles. A look at this week’s art news, including a new 30-year survey of work by Tania Bruguera, and events and exhibitions from Rome to Basel. A look at this week’s art news, including Matthew Ritchie’s latest work and events and exhibitions from Hartford to Zurich. A look at this week’s art news, including Tania Bruguera’s latest project, CycleNews, and events and exhibitions from St. Louis to Istanbul. A look at this week’s art news, including a new public art installation by Martin Puryear, and events and exhibitions everywhere from Los Angeles to Barcelona. A look at this week’s art news, including rave reviews for Mark Bradford’s work at the Venice Biennale, and events and exhibitions everywhere from St. Louis to Los Angeles. A look at this week’s art news, including Jeff Koons’ new public art installation at Rockefeller Center, and events and exhibitions everywhere from Chicago to Shanghai. A look at this week’s art news, including the 57th Venice Biennale opening Saturday, and events and exhibitions everywhere from Savannah to St. Louis. The Art21 Magazine is transitioning its Writer-in-Residence program to an Educator-in-Residence, inviting a member from the Art21 Educators community to contribute to each issue. A look at this week’s art news, including recent awards won by artists Mika Tajima and Do Ho Suh, and events and exhibitions in NYC, Seattle, Beverly Hills, and Marseille. See what Art21 was up to in April, including a new film release on artist Sarah Sze, and a featured playlist curated by Season 7 artist Arlene Shechet. The Art21 staff presents a selection of our favorite films and exhibitions in New York. A look at this week’s art news, including Kerry James Marshall being named one of Time’s 100 Most Influential People, and events and exhibitions everywhere from Dallas to Dublin. A look at this week’s art news, including Robert Ryman’s multi-million dollar donation to the Dia Art Foundation, and events and exhibitions everywhere from Atlanta to Athens. 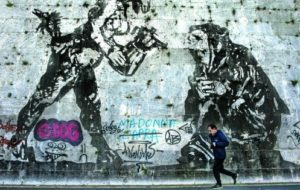 A look at this week’s art news, including the restoration of William Kentridge’s large-scale mural in Rome, and events and exhibitions everywhere from Salt Lake City to San Francisco. A look at this week’s art news, including recent awards won by Theaster Gates and Laylah Ali, and events and exhibitions everywhere from New York to Napoli.